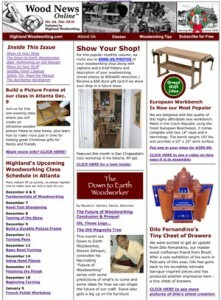 The December edition of Wood News is out, and this month it is packed full of entertaining and informative woodworking articles for you to enjoy. One of our themes for December seems to be how much you can accomplish in a small space. First we have another update from Dilo Fernandino, our Brazilian master wood craftsman friend who works in a 7’x6′ closet. And then our Show Us Your Shop column features Dan Chiappetta’s cozy 9’x12′ workshop in his Astoria, NY apartment. Hopefully seeing these two examples will inspire all of us to make the most of the space we do have to create some great new woodworking projects this winter. And speaking of woodworking ‘stuff’, we’ve got some great ‘stuff’ on display in the Show Us Your Stuff column: two rocking chairs and a beautiful buffet built by Steve Szilvagyi of Onekama, MI. This month our Down to Earth Woodworker, Steven Johnson, concludes his fascinating article about the Future of Woodworking with some predictions and thoughts about how we can shape the future of our craft. He also tells a touching story of an old magnolia tree that has made him appreciate the wood he is working today. All this plus another great workbench article from Richard Rank, an important safety tip from Laura Jack and many great gift ideas for the holidays make this month’s edition of Wood News a must-read. Check it out today!